Simple to-do task management list. Is there a better alternative to SimpleToDo? Is SimpleToDo really the best app in Personal Info Managers category? 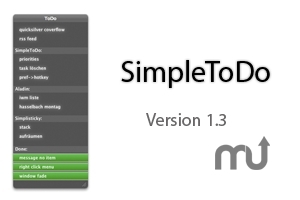 Will SimpleToDo work good on macOS 10.13.4? SimpleToDo is a minimalistic ToDo-List, with Quicksilver support and some nice CoreAnimation effects. It is completely usable with the keyboard. Version 2.3: I did not only converted and cleaned the source to work better with MonoMate, I also fixed some bugs, improved the layout and added the possibility of highlighting your tasks with a colors. SimpleToDo needs a rating. Be the first to rate this app and get the discussion started!